I have just been to the best children’s party I’ve ever attended. Ok, so maybe that’s not saying much: children’s parties aren’t exactly known for their entertainment value to adults. But this was different and I can honestly say it was an enjoyable and even relaxing experience. The words “Children’s party” and “relaxing” don’t usually go together in the same sentence but in this case it was true. It was a birthday party for one of Elizabeth’s friends and was held in Countesswells Woods which is on the outskirts of Aberdeen. 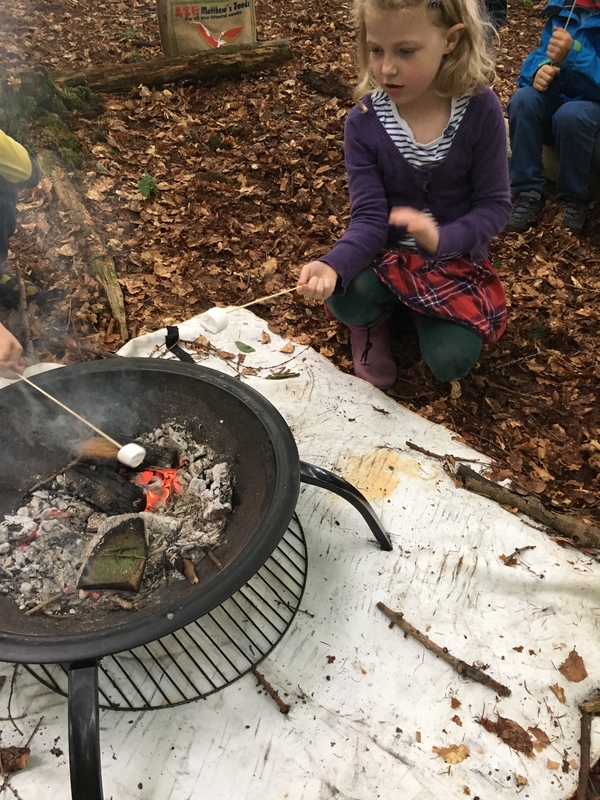 It was run by a group called OWLS – Outdoor Woodland Learning School – and they got the children building dens, gathering twigs for the fire, and toasting marshmallows. Countesswells Woods was so beautiful. I’ve never seen such enormous beech trees and the forest floor is a carpet of ferns. They made their own pizzas and cooked them under the fire. I had a strange dream last night. I dreamt about a dress I saw on the web some months ago and liked but haven’t thought about since. For some reason it turned up in my dream and I woke up feeling certain that I had to buy it. Unfortunately the shop had sold out of all sizes except size 14 which is too big for me. I ended up buying it anyway and will get a dressmaker to resize it. Is that madness or what? Posted in Journal and tagged Aberdeen, beech trees, Countesswells Woods, dream, dreams, dress, forest, owls, parties. Bookmark the permalink. What an absolutely brilliant party. Good luck with the new dress! This is such a cool birthday party idea! And that forest looks beautiful. It’s the best children’s birthday party I’ve ever attended. I’m thinking of doing it for my kids but their birthdays are in winter. I did ask the person from OWLS about it and he seemed to think it would work in winter too, provided they were all appropriately dressed. Really like the idea of cooking pizza in the woods!